There has been a lot written about the benefits of homeownership. One benefit that continues to rise to the top is the added wealth homeowners gain simply by paying their mortgage while their home increases in value over time.The National Association of Realtors (NAR) recently broke down the equity gained from price appreciation and principal payments in their Economists Outlook Blog. 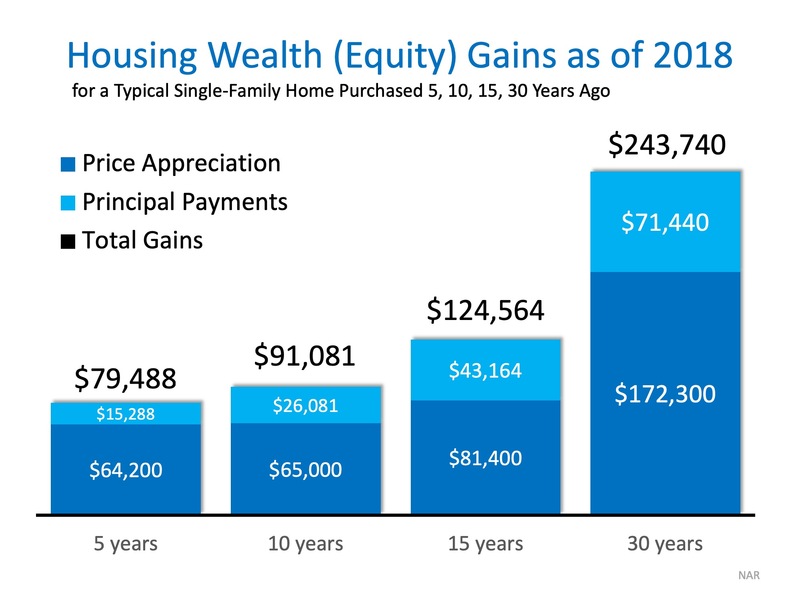 Homeowners who purchased their homes five years ago have already gained almost $80,000 in equity over that time with 80% of the gains coming from price appreciation.For a homeowner who purchased their home 30 years ago, they have gained nearly $250,000 in equity with 70% coming from price increases. The full results can be seen in the chart below. According to the Home Price Expectation Survey, a family who purchased a median priced home this January can expect to gain more than $42,000 over the next five years simply from price appreciation alone.